Please refer to the Web map specification topic for an updated version of the web map specification. When you make and save a map using ArcGIS.com or Portal for ArcGIS, the map receives a unique ID. You can reference this ID to pull the entire map into any application you build with Esri APIs. 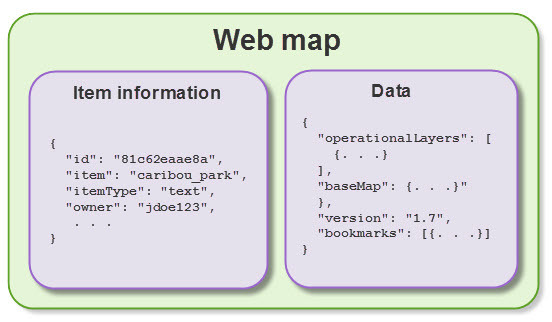 This is made possible through the ArcGIS web map, a structured series of key-value pairs that describe all the layers, pop-up information, bookmarks, metadata, and other properties of the map. Web map item information contains a title, description, and other metadata used to advertise the web map on ArcGIS.com or your own organization's portal. Web map data contains information needed to display the map, including layers, pop-up information, and bookmarks. The web map and its specification should not be confused with the ExportWebMap specification, which is used by ArcGIS Server when printing maps. Although you may notice similarities in properties, they are two different specifications.